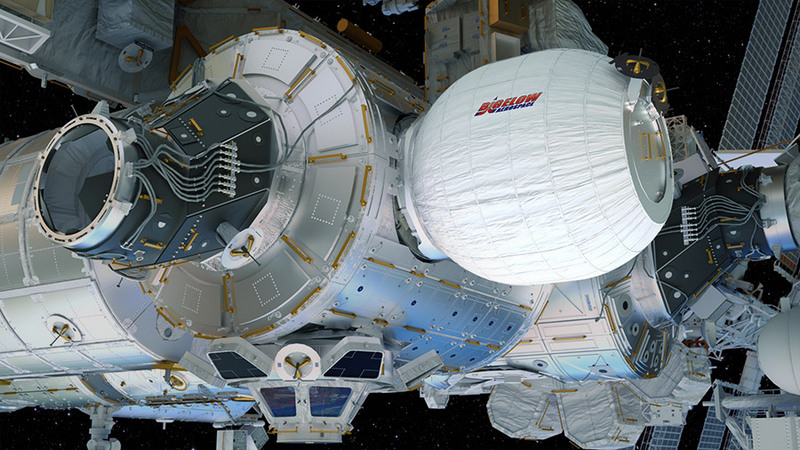 BEAM, the Bigelow Expandable Activity Module, is depicted in its expanded configuration in this computer rendering. NASA and Bigelow Aerospace have rescheduled their media teleconference for today from noon EDT to 2 p.m. to discuss the status of the Bigelow Expandable Activity Module (BEAM). Engineering teams monitored the module overnight for structural changes after attempts to fully expand the module yesterday were unsuccessful. They have been meeting throughout the morning to discuss the next steps. With the exception of the change in time, call-in details remain the same for any reporters who have already registered to participate. To participate in the teleconference, media must contact Cheryl Warner at cheryl.m.warner@nasa.gov or Tabatha Thompson at tabatha.t.thompson@nasa.gov, or call 202-358-1100 for call details. The teleconference will stream live at www.nasa.gov/newsaudio. I can remember from years ago, that Just a couple of “second” puffs of air was not going to inflate my flat tire! That BEAM has been in a squeezed up state for a while so it will need a bit more puff to pop it open and maybe a gentle tweak with the Canada arm to help it on the way and all will be fine…., it is after all a brilliant development and sometimes a little nudge will make all the difference. Maybe next time use a bit of french chalk on the outside before compressing for transport and there will be no sticking together…..simple things work well……….